Stuttgart, September 2013 – Following an intensive planning and construction phase, Coperion GmbH, Stuttgart/Germany, recently opened the world’s largest compounding test center. It replaces the existing test center and serves to provide customers both the optimum system design for required throughput rate capacity of compounding lines – under close to production conditions – and to carry out tests aimed to further develop processes. Additionally, the center will execute internal tests with new machine components. The test center is equipped with 20 different ZSK extruders with throughput rates ranging from 10 to 3,000 kg/hr, including the latest generation machines, the ZSK Mc18 series, for products requiring high energy input and the ZSK MEGAvolume PLUS machines for high volume throughput. Available for use in conjunction with the extruders are numerous feedstock metering units. They cover all possible throughput rates for materials of widely varying handling characteristics and – in the case of liquids – all possible viscosities. In the course of the next few months these metering units will be complemented by new units from Coperion K-Tron. With a footprint of 2,700 m² and floorspace of 4,500 m² on three levels, the test center design permits the installation of trial set-ups corresponding exactly to actual production conditions. Quality control tests and analyses are carried out in the analytical laboratory located within the test center. The test center will accommodate up to 100 customer trials per year. For compounding trials with engineering plastics the modular design of the ZSK twin screw extruders provide configuration flexibility and can therefore be set up exactly in accordance with customer requirements. Depending on the objective of the trial, the throughput rate ranges from laboratory requirement through to medium production runs. Available pelletizing equipment includes waterring pelletizers (WRG), underwater pelletizers (UG), eccentric pelletizers (EGR) and centric pelletizers (ZGF) from Coperion as well as strand pelletizers from Coperion Pelletizing Technology. Special material needs can be met by Coperion’s latest developments such as FET (Feed Enhancement Technology) and the twin screw degassing unit (ZS-EG), both of which ensure successful, state-of-the-art process development. A room specifically equipped for degassing trials meets all relevant safety requirements. The results of the trials carried out in the test center are then reliably scaled up by Coperion’s experts to actual production levels. In a facility next to the test center, complete modular design compounding systems can be assembled specifically for commissioning purposes and tested with the customer’s product. 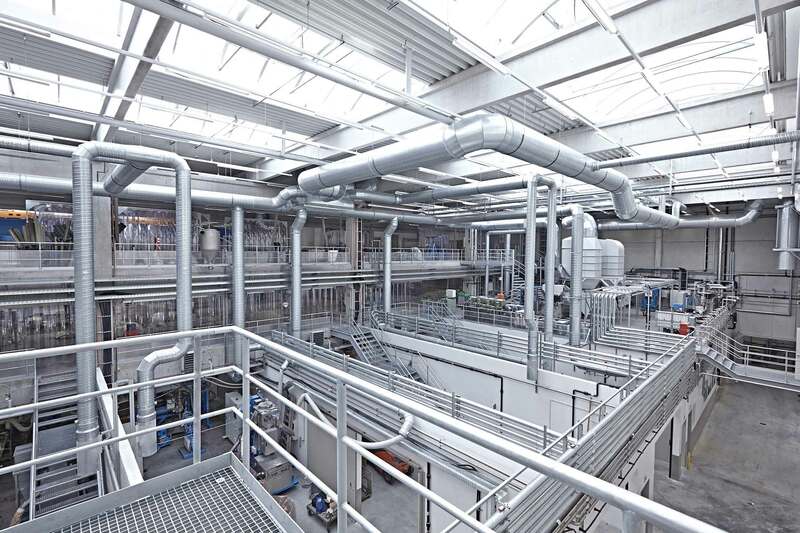 The extrusion systems of polyolefin producers are currently capable of throughput rates between 60 and over 100 tons/hour and must be reliably designed – more than ever before – for continuous operation, a requirement that makes equal demands on the machine and the process. It is precisely for this reason that the largest room in Coperion’s new test center is equipped with state-of-the-art technology for scale-up and development trials for customers in the polyolefin industry. Virtually all polyolefin applications can be simulated. The widest diversity of requirements can be met by ZSK extruders, equipped either with or without gear pump, and a two-stage ZSK NT for particularly difficult extrusion applications.Integrated into the test center is a food-processing area specially equipped for extrusion trials with foodstuffs. Besides the new test center in Stuttgart, Coperion also has two other compounding test centers. One of them is located in Ramsey, NJ/USA, and is equipped with several ZSK extruders, including two ZSK Mc18 extruders, for customer trials. The newly built test center in Nanjing/China is equipped with two STS compounders. 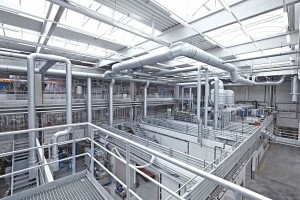 The company also operates the world’s largest bulk material test center in Weingarten/Germany. This test center network is the only one in the world which covers the entire process chain for the compounding of plastics.